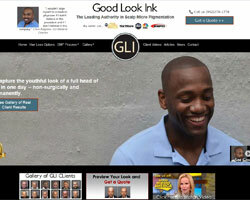 Good Look Ink is one of the premier scalp micropigmentation providers in the United States. Based close to Minneapolis in Minnesota, Good Look Ink has changed the lives of many thousands of clients and established itself as one of the industry leaders. Headquartered in Burnsville Minnesota, Good Look Ink has been quietly plugging away since 2007, offering scalp micropigmentation treatments using their own CTHR process. Quietly that is, until they were featured on Good Morning America, after which the profile of the business was accelerated to a whole new level. The birth of GLI could not have come at a better time. 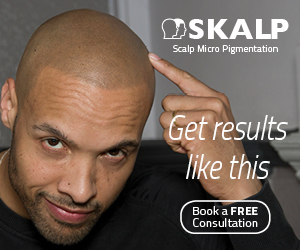 Scalp micropigmentation services were just starting to gain the recognition they deserved, however there was still a shortage of quality practitioners in the United States, and those that existed were based in New York, California and Florida, a long way from Minneapolis and beyond the reach of the majority of people there. At last there was a high quality provider able to serve clients in Minnesota, as well as neighboring states Wisconsin, Iowa, North Dakota, South Dakota and Nebraska although from what I understand, clients travel much further than that to have their treatments at GLI. CTHR stands for Cosmetic Transdermal Hair Replication, and is the name of the specific scalp micropigmentation process developed and adopted by Good Look Ink. Good Look Ink do not use the name CTHR any more, as the terminology “scalp micropigmentation” has become so widely used. Want to see some results? The following photos are taken from the GLI website, and show recent results achieved by the company. An exciting development – 3D SMP! There has been a lot of chatter in recent years about the potential development of a 3D-looking version of standard pigmentation techniques. I seem to recall one particular provider trying this (who shall remain nameless) but the results were extremely poor so they abandoned the idea. Now for the first time, Good Look Ink have published photographs showing their new 3D offering in action, and the results look extremely promising. It is too early to say how reliable, repeatable and durable these new 3D treatments will be, but time will tell. When you think about it, a three dimensional option is a logical way for modern SMP techniques to progress to the next level, even if the most that can be achieved is a 3D illusion. From what I can see, this is the closest you’ll get to a high density hair transplant procedure without actually having one, with none of the drawbacks such as scarring, high cost and uncertainty of long term results. Although we stop short of recommending any particular provider at SMP Debate, it has to be said that Good Look Ink are definitely one of the longest established companies and they do have a good track record. If you’re interested in this kind of hair loss treatment and Minnesota is within striking distance, GLI are well worth checking out.